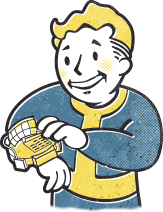 Gift cards purchased at https://gear.bethesda.net/ can only be redeemed for physical merchandise at https://gear.bethesda.net and WILL NOT WORK on any other Bethesda.net site or service. We do not accept returns or process refunds on purchased gift cards unless where prohibited by law. If you request a refund of a purchase that was made with a gift card. You can only be refunded to a newly issued gift card. Gift cards expired 5 years after date of purchase unless where prohibited by law. Why would you have gift card and not use it! Please buy something rad! Q: Can more than one gift card be used towards a purchase? A: Yes. A customer can redeem another gift card during checkout. Q: Can a gift card be used to buy a gift card? A: No, you can't use a gift card to buy another gift card. Q: Can a gift card be used to pay for shipping and taxes? A: Yes, gift cards are applied to the final order total which includes shipping and taxes. Q: Can I apply a discount code to my gift card purchase? A: Most discount codes cannot be applied to the purchase of a gift card. Q: Can gift cards be used in conjunction with a discount code? A: Yes, gift cards are a form of payment. Q: Can a gift card be redeemed or returned for cash?